1 E None No Power Seat 1 E is a standard Business Class seat, however the proximity to the lavatory and galley may be bothersome. 1 G None No Power Seat 1 G is a standard Business Class seat, however the proximity to the lavatory and galley may be bothersome. 23 A None No Power Seat 23 A is a standard Economy Class seat, however, the proximity to the lavatories may be bothersome. This seat may have limited recline. 23 C None No Power Seat 23 C is a standard Economy Class seat, however, the proximity to the lavatories may be bothersome. This seat may have limited recline. 23 D None No Power Seat 23 D is a standard Economy Class seat, however, the proximity to the lavatories may be bothersome. 23 G None No Power Seat 23 G is a standard Economy Class seat, however, the proximity to the lavatories may be bothersome. 23 H None No Power Seat 23 H is a standard Economy Class seat, however, the proximity to the lavatories may be bothersome. This seat may have limited recline. 23 K None No Power Seat 23 K is a standard Economy Class seat, however, the proximity to the lavatories may be bothersome. This seat may have limited recline. 24 D None No Power Seat 24 D is a standard Economy Class seat, however, the proximity to the lavatories may be bothersome. This seat may have limited recline. 24 E None No Power Seat 24 E is a standard Economy Class seat, however, the proximity to the lavatories may be bothersome. This seat may have limited recline. 24 F None No Power Seat 24 F is a standard Economy Class seat, however, the proximity to the lavatories may be bothersome. This seat may have limited recline. 24 G None No Power Seat 24 G is a standard Economy Class seat, however, the proximity to the lavatories may be bothersome. This seat may have limited recline. 25 A None No Power Seat 25 A is a standard Economy Class seat that has extra legroom, however, the proximity to the lavatories may be bothersome. The tray table and inflight entertainment monitor are installed in a fixed armrest, therefore, seat width is slightly reduced. Floor storage is not available during takeoff and landing. 25 C None No Power Seat 25 C is a standard Economy Class seat that has extra legroom, however, the proximity to the lavatories may be bothersome. The tray table and inflight entertainment monitor are installed in a fixed armrest, therefore, seat width is slightly reduced. Floor storage is not available during takeoff and landing. 25 D None No Power Seat 25 D is a standard Economy Class seat that has extra legroom, however, the proximity to the lavatories may be bothersome. The tray table and inflight entertainment monitor are installed in a fixed armrest, therefore, seat width is slightly reduced. Floor storage is not available during takeoff and landing. 25 E None No Power Seat 25 E is a standard Economy Class seat that has extra legroom, however, the proximity to the lavatories may be bothersome. The tray table and inflight entertainment monitor are installed in a fixed armrest, therefore, seat width is slightly reduced. Floor storage is not available during takeoff and landing. 25 F None No Power Seat 25 F is a standard Economy Class seat that has extra legroom, however, the proximity to the lavatories may be bothersome. The tray table and inflight entertainment monitor are installed in a fixed armrest, therefore, seat width is slightly reduced. Floor storage is not available during takeoff and landing. 25 G None No Power Seat 25 G is a standard Economy Class seat that has extra legroom, however, the proximity to the lavatories may be bothersome. The tray table and inflight entertainment monitor are installed in a fixed armrest, therefore, seat width is slightly reduced. Floor storage is not available during takeoff and landing. 25 H None No Power Seat 25 H is a standard Economy Class seat that has extra legroom, however, the proximity to the lavatories may be bothersome. The tray table and inflight entertainment monitor are installed in a fixed armrest, therefore, seat width is slightly reduced. Floor storage is not available during takeoff and landing. 25 K None No Power Seat 25 K is a standard Economy Class seat that has extra legroom, however, the proximity to the lavatories may be bothersome. The tray table and inflight entertainment monitor are installed in a fixed armrest, therefore, seat width is slightly reduced. Floor storage is not available during takeoff and landing. 33 D None No Power Seat 33 D is a standard Economy Class seat. The seat juts into the aisle and may often be bumped by other passengers or crew members. 33 G None No Power Seat 33 G is a standard Economy Class seat. The seat juts into the aisle and may often be bumped by other passengers or crew members. 34 D None No Power Seat 34 D is a standard Economy Class seat. The alignment with the seat in front might be awkward. 34 E None No Power Seat 34 E is a standard Economy Class seat. The alignment with the seat in front might be awkward. 34 G None No Power Seat 34 G is a standard Economy Class seat. The alignment with the seat in front might be awkward. 37 C None No Power Seat 37 C is a standard Economy Class seat, however, the proximity to the lavatory and galley may be bothersome. 37 D None No Power Seat 37 D is a standard Economy Class seat located in the last row of the plane and may have limited recline. The proximity to the lavatory and galley may be bothersome. 37 E None No Power Seat 37 E is a standard Economy Class seat located in the last row of the plane and may have limited recline. The proximity to the lavatory and galley may be bothersome. 37 G None No Power Seat 37 G is a standard Economy Class seat located in the last row of the plane and may have limited recline. The proximity to the lavatory and galley may be bothersome. 37 H None No Power Seat 37 H is a standard Economy Class seat, however, the proximity to the lavatory and galley may be bothersome. 38 A None No Power Seat 38 A is a standard Economy Class seat located in the last row of the plane and may have limited recline. The proximity to the lavatory and galley may be bothersome. 38 C None No Power Seat 38 C is a standard Economy Class seat located in the last row of the plane and may have limited recline. The proximity to the lavatory and galley may be bothersome. 38 H None No Power Seat 38 H is a standard Economy Class seat located in the last row of the plane and may have limited recline. The proximity to the lavatory and galley may be bothersome. 38 K None No Power Seat 38 K is a standard Economy Class seat located in the last row of the plane and may have limited recline. The proximity to the lavatory and galley may be bothersome. 6 C None No Power Seat 6 C is a standard Business Class seat, however the proximity to the lavatory and galley may be bothersome. 6 D None No Power Seat 6 D is a standard Business Class seat, however the proximity to the lavatory and galley may be bothersome. 6 F None No Power Seat 6 F is a standard Business Class seat, however the proximity to the lavatory and galley may be bothersome. 6 H None No Power Seat 6 H is a standard Business Class seat, however the proximity to the lavatory and galley may be bothersome. 6 K None No Power Seat 6 K is a standard Business Class seat, however the proximity to the lavatory and galley may be bothersome. 7 A None No Power Seat 7 A is a standard Economy Class seat, however the proximity to the lavatory and galley may be bothersome. The tray table and inflight entertainment monitor are installed in a fixed armrest, therefore, seat width is slightly reduced. Floor storage is not available during takeoff and landing. 7 C None No Power Seat 7 C is a standard Economy Class seat, however the proximity to the lavatory and galley may be bothersome. The tray table and inflight entertainment monitor are installed in a fixed armrest, therefore, seat width is slightly reduced. Floor storage is not available during takeoff and landing. 7 D None No Power Seat 7 D is a standard Economy Class seat, however the proximity to the lavatory and galley may be bothersome. The tray table and inflight entertainment monitor are installed in a fixed armrest, therefore, seat width is slightly reduced. Floor storage is not available during takeoff and landing. 7 E None No Power Seat 7 E is a standard Economy Class seat, however the proximity to the lavatory and galley may be bothersome. The tray table and inflight entertainment monitor are installed in a fixed armrest, therefore, seat width is slightly reduced. Floor storage is not available during takeoff and landing. 7 F None No Power Seat 7 F is a standard Economy Class seat, however the proximity to the lavatory and galley may be bothersome. The tray table and inflight entertainment monitor are installed in a fixed armrest, therefore, seat width is slightly reduced. Floor storage is not available during takeoff and landing. 7 G None No Power Seat 7 G is a standard Economy Class seat, however the proximity to the lavatory and galley may be bothersome. The tray table and inflight entertainment monitor are installed in a fixed armrest, therefore, seat width is slightly reduced. Floor storage is not available during takeoff and landing. 7 H None No Power Seat 7 H is a standard Economy Class seat, however the proximity to the lavatory and galley may be bothersome. The tray table and inflight entertainment monitor are installed in a fixed armrest, therefore, seat width is slightly reduced. Floor storage is not available during takeoff and landing. 7 K None No Power Seat 7 K is a standard Economy Class seat, however the proximity to the lavatory and galley may be bothersome. The tray table and inflight entertainment monitor are installed in a fixed armrest, therefore, seat width is slightly reduced. Floor storage is not available during takeoff and landing. This Airbus A330-200 is primarily used on medium to long-haul flights. 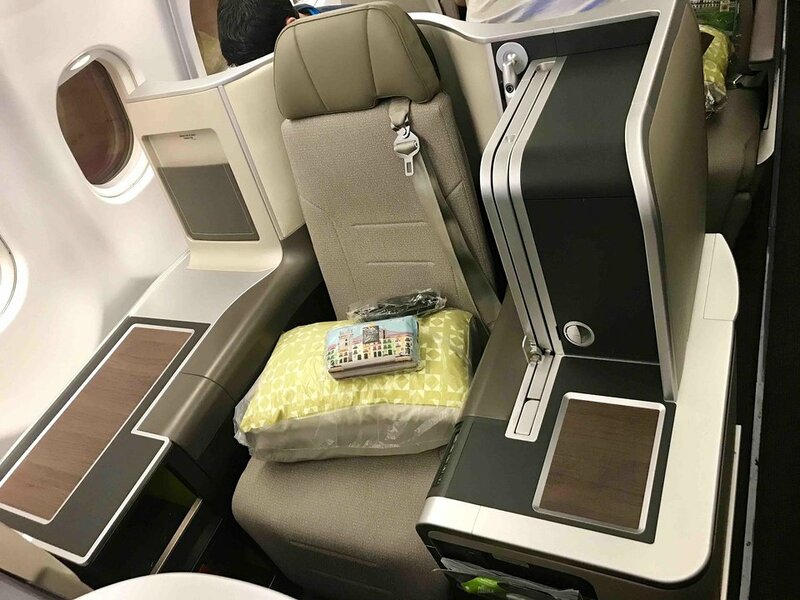 It features 25 flat bed seats in Business Class and 244 standard Economy seats. Extremely short seat pitch; magazine pocket frame pressed hard against my knees as soon as I sat down. When seat in front reclined it was painful- never again! Seats were ok for width; sound system poor; USB in seat back a new feature. Meal included an almond dessert labelled in 32 point Portuguese for a nut allergic person! Smooth flight. check in person did not know if first 5-6 Economy rows had more leg room but wanted an additional 40 euros each for us to find out. Avoid 3J is you are >60kg. Extremely narrow seat when inclined. The width was narrow and the leg room small. This seat was billed as extra leg room costing me 40 euro.